In the last one month, besides major electoral reverses, the Union government has faced another crisis that has been brewing for long and has started to show symptoms of electorally damaging its prospects further. It is India’s agrarian crisis, and to be precise, the challenge of ensuring farmers the right price for their produce when they deliver historic harvests. So it was expected that there would be hectic parleys at the highest level to tide over this crisis, if not to offer solace to farmers, in the greater electoral interest. And it is urgent: there are just two seasons of sowing left before India votes for a new government in May 2019. Prime Minister Narendra Modi met experts; inaugurated a major function in a premier agriculture institute; and the NITI Aayog is already working on a “package” to double farmers’ income as promised by 2022. But as officials point out, it is not this target that the government is serious about but the immediate ways to give out a message in a few months that the government is serious about the agrarian crisis. This is where the desirable political focus on agriculture again fails to reap a fair deal for farmers. After the budget assertion of giving farmers 50 per cent plus cost Minimum Support Price (MSP), this has become the axis of the government’s strategy to fix the crisis. Modi has reiterated this many times in recent weeks. The assumption is that declaring high MSP will calm down restless farmers and this is the only big ticket declaration that can be made within the next two sowing seasons. Now, a reality check on why high MSP might not be the solution to the deep crisis and farmers might not even buy this as a solution to their many woes. The government’s own Committee on Doubling of Farmers’ Income has already junked the effectiveness of MSP as a measure to increase income. 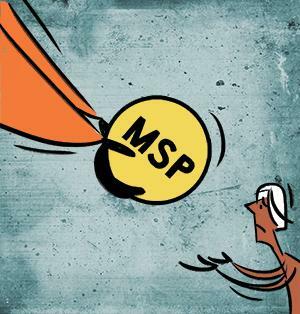 “Though MSP is an important intervention by the government, it is not sufficient by itself. The honouring of the MSP through its use in procurement is a more substantive condition in making the MSP mechanism effective. Hence, there is the need for a bouquet of procurement tools that can cater to different commodities in different ways,” the Committee observes. The fact is hardly 10 per cent of farmers sell their produce at MSP rate. Not all produce is procured at MSP. Most farmers are not aware of MSP before sowing. According to a NITI Aayog study covering 36 districts in 14 states, only 10 per cent of farmers were aware of MSP before sowing while 62 per cent were informed after it. “The pricing policy of MSPs would be effective only if farmers are aware of it at the time of deciding which crops to grow,” the Committee says. There is another reason why focusing unilaterally on MSP to change farmers’ fates is misplaced. The Committee has come to the conclusion that even a 50 per cent plus cost MSP would not help till we change our approach to agriculture from a losing traditional practice to a thriving enterprise. “The cost plus price proposed for farmers, by implication, restricts them to a fixed margin against cultivation cost. Even if 50 per cent is added as profit margin on costs, the subsequent value to a farmer is far removed from the wholesale price at terminal markets. The price dispersion at farm gates and between them and wholesale markets is large for most crops. This is a relevant reality to be considered when assessing value of the produce and the share of that value assigned to farmers. A mindset shift that looks at market-linked realisation, instead of administered returns to farms is needed to take agriculture into enterprise mode.” This is the change in approach that should define a new deal to farmers. (This article was first published in the April 1-15th issue of Down To Earth).